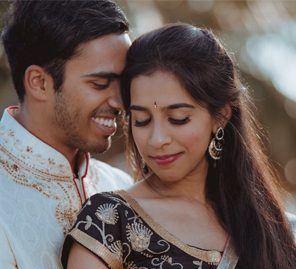 From beautiful color palettes to blending Indian and Vietnamese decor accents, Valerie and Shyam’s cross-cultural wedding in Koh Samui was a swoon-worthy affair. 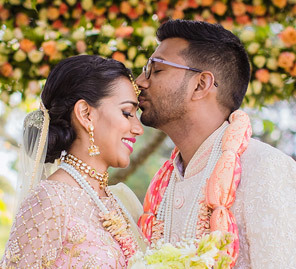 Valerie and Shyam chose vibrant color palettes for each of their wedding ceremonies to create a sophisticated feel to match the natural beauty of the InterContinental Samui Baan Taling Ngam Resort in Koh Samui, Thailand. Here, we share some highlights of this picture-perfect Thailand wedding. The couple chose the luxurious InterContinental Samui Baan Taling Ngam Resort in Thailand for their nuptials. A beach atmosphere for their wedding vows with an event by the sea, and some pre-wedding functions on the lush beachfront lawn were all that they needed to celebrate their big day. Other interesting touches included unique decor elements with a touch of Indian and Vietnamese cultures alongside Thai instrumental bands and dancers. The five-day extravaganza kick-started with some color – the color of mehndi. The decor, traditional rituals and dozens of vibrant flower arrangements, was celebratory and very traditionally Indian. 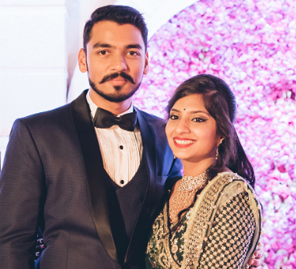 Guests dressed up in traditional wear which only highlighted the vibe of the function. This spectacular ceremony was a beautiful blend of historic and contemporary traditions. The bride and groom took their vows and later served Chrysanthemum Tea as a sign of respect, starting with the eldest family members. This beautiful ceremony honors the family’s ancestors and relatives. The bride was a vision in her traditional red ensemble called ‘Ao Dai’ as she was escorted by her bridesmaids who matched her in their vibrant yellow outfits. The groom also wore a traditional blue ‘Ao Dai’ with a circular headdress called a Khan Dong. This couple marked the beginning of their new journey as they took their vows at a spot overlooking the azure seas. The wedding was organized right on the beach by the sea. 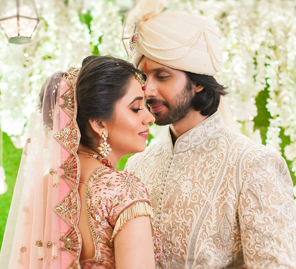 The setting was breathtaking as they exchanged their vows outdoors in the mandap that was created using fresh lavenders, roses, white drapes and traditional arrangements. It was a perfect day setting for the traditional wedding. The couple chose a crisp white, cream and gold color theme to create a sophisticated feel that complemented the natural beauty of the beautiful property. For a “wow” factor, the decor team created an impressive floral based path, as well as some unique rose bouquets for the bride and her bridesmaids. Valerie looked gorgeous in a white ensemble and glamorous hair and makeup. The photographers captured every detail and breathtaking view at this wedding, including the couple’s sunset portraits on the pier. The ceremony was followed by the after-party where the couple cut the cake and joined in some fun games for the evening.